Necessity really was the mother of invention for Daphne Cohan, a Weaverville mom who runs The High Fiber, a blossoming business she operates out of her basement. 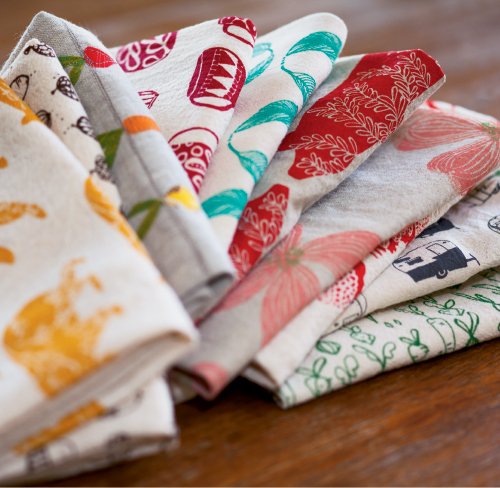 It’s there, with her sewing machine and silk screen inks, that Daphne makes kitchen linens and other cloth products. Colorful carrots and bright red radishes decorate the corners of soft, organic cotton napkins. Lemons and leaves, fish and fowl are playfully splayed across her bibs and adorable onesies. Daphne, who operates the company with her husband, Ed, makes each item as if it were intended for her own family. She uses only American-made or ethically sourced fabric and solvent-free, nontoxic inks. All the designs are her own, patterned after the vegetables that grow in the family’s organic garden and the six inquisitive chickens that peck the ground outside their house. The High Fiber got started in 2008, when Daphne was putting together her daughter’s lunch one day and ripped the zipper out of the lunch bag. She didn’t want to use plastic bags or containers, so she started making her own cloth ones. “I took them on a couple of play dates with other moms, and they started asking for them,” she recalls. “And then their friends started asking for them.” As word spread, the line increased to include towels. Now Daphne and Ed head out with their pop-up camper nearly every weekend to sell at art shows and craft fairs throughout the South. The High Fiber, so named because of Daphne’s admitted addiction to fabric, is widely available in Asheville, a testament to her craft and creativity. It has been picked up by other shops in the Carolinas and, notably, by the Ogden Museum of Southern Art in New Orleans.